It’s like the Christmas favorite, “It’s a Wonderful Life” — what would Bedford Falls be like if George Bailey never existed? In this case it is, what would Philadelphia and its surrounding counties be like if the Archdiocese of Philadelphia didn’t exist? 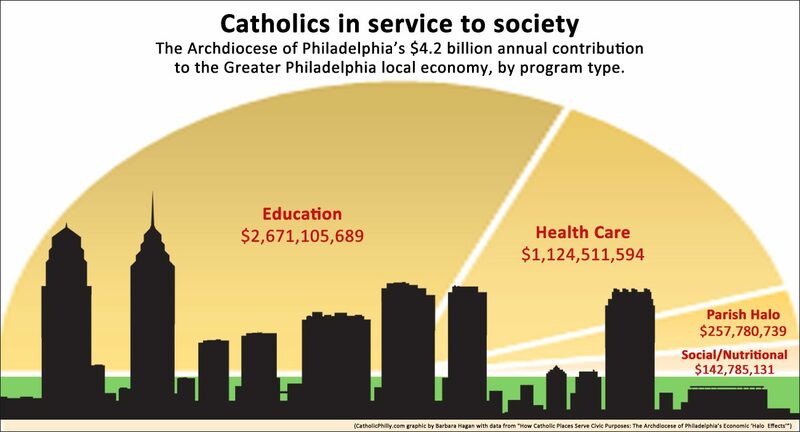 Or more prosaically, what is the economic impact of the archdiocese on the Philadelphia area? Quite large — an estimated $4.2 billion annually, according to a report by the University of Pennsylvania-based Collegium Institute for Catholic Thought and Culture and the Program for Research on Religious and Urban Civil Society. 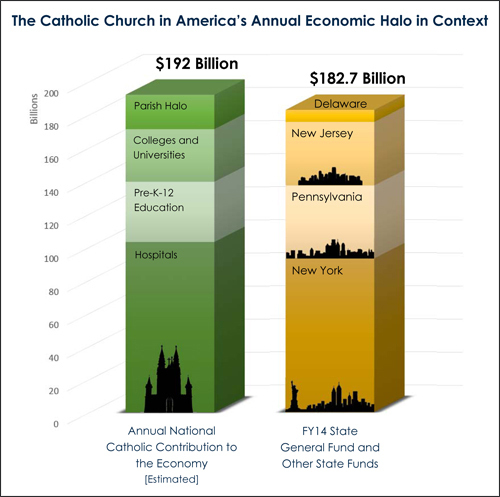 The report, “How Catholic Places Serve Civic Purposes: The Archdiocese of Philadelphia’s Economic ‘Halo Effects,’” was prepared by Joseph P. Tierney, executive director of the Robert A. Fox Leadership Program at Penn, was presented at Penn Hillel on Nov. 30 with Archbishop Charles J. Chaput giving an opening address. The moderator was Dr. Ram Cnaan, director of Penn’s Program for Religion and Social Policy Research. Panelists included Tierney; Lorraine M. Knight, executive director of the archdiocese’s Nutritional Development Services; and A. Robert Jaeger, president of Partners for Sacred Places. In his remarks, Archbishop Chaput said the Catholic contribution to civic life is effective because it is never simply humanitarian. That $4.2 billion impact of the Catholic Church on the Philadelphia region manifests in four major areas, according to the study and as explained by Tierney: education; health care; parish halo (the direct spending by the 217 parishes of the archdiocese and such intangibles as the use of parish facilities by various groups and the cost of obtaining those services elsewhere); and social and nutritional services. If the experience of the Philadelphia Archdiocese is representative of the United States as a whole, then the Catholic contribution to civic life in America appears quite large — at least $192 billion annually, according to the report. By far the largest component in the report is education, which accounted for $2.67 billion. Within this subgroup was the costs incurred by the 10 Catholic colleges and universities in the archdiocese, based on actual reports, with a total of $1.39 billion per year. To this, Tierney added $4 million for the annual budget of the Catholic schools of special education. For the rest of Catholic education Tierney’s calculations were not based on actual expenditures but by determining the “halo” by using a method borrowed from Partners for Sacred Places. Tierney and his colleagues calculated the average cost of educating a pupil in the 63 public school districts in the five-county Philadelphia area and came up with a per pupil cost of $18,451, which they multiplied by the number of students in the Catholic high schools and elementary schools including private Catholic schools. Between the Catholic colleges, high schools, elementary schools and parish religious education programs, 155,422 individuals were under Catholic instruction in 2015, according to the current Catholic Directory of the archdiocese. Health care services, which totaled $1.12 billion, were drawn mostly from the operating expenses of the six Catholic hospitals and health care systems located in Southeastern Pennsylvania but not owned by the Philadelphia Archdiocese. The report noted these providers served 833,901 patients in the past year. Catholic social services provided by the archdiocese amounted to $122 million, and added to this was the $20 million of Nutritional Development Services. Among other things, NDS provides 4 million meals to 37,000 children in 92 schools and another 2.8 million meals to children in day care programs, summer feeding programs and after school programs. The Catholic community in the archdiocese totals 1.37 million people, according to the Catholic Directory. Such an approach to social service would be “simply a form of coercion (that) would demean the people we’re trying to serve” by robbing them of their freedom. Adding it all up, Tierney calculates the archdiocese contributes $4,196,183,153 of economic impact on the region. Is the estimate too high? Quite the opposite, Tierney believes, because it does not include a number of other Catholic-based service programs that are not under archdiocesan auspices. To put it into perspective, that $4.2 billion the Catholic Church contributes to the local economy is slightly larger than the City of Philadelphia’s General Fund budget of $4 billion, according to Tierney’s report. That contribution is not all about numbers. The impact really is about service to the community. The national sum is estimated to be greater than the combined annual budgets, totaling $182 billion, of four states — New York, Pennsylvania, New Jersey and Delaware. That includes an estimated $36.4 billion of economic value in pre-K to grade 12 education, $31.8 billion in total annual expenses by Catholic colleges and universities, $103 billion in expenses by Catholic hospitals and $20.8 billion in economic activity by the country’s 17,651 Catholic parishes. The report alludes to a point made by Archbishop Chaput about the challenge of Catholic engagement in civic life. “Cooperation can sometimes run the risk of turning Catholic organizations into sub-contractors for donors, foundations and public agencies with very different anthropologies and thus very different notions of authentic human development,” he said. “That can compromise both the purpose and the effectiveness of Catholic social work. Certainly many of the social programs the archdiocese and Catholic organizations run are heavily dependent on federal, state and local funding. But would all those programs exist at all, and in what form or cost, without the archdiocesan initiative? You don’t need Clarence, George Bailey’s guardian angel, to demonstrate the answer to that. Glad I’m a cradle catholic living in this Archdiocese!!! Thank you.